In lieu of flowers, Dave's family would like people to make donations in his name to the Hairy Cell Leukemia Research Foundation. There is a PAYPAL button on the site to accept donations of any amount in a convenient, secure manner. The Hairy Cell Leukemia Research Foundation is a non-profit, all volunteer, patient run organization whose primary goal is to provide support and information. Research is supported with funds received from patients, their families and their friends. You can pay your last respect to Dave Stevens on the Memorial page of the Authorized Dave Stevens Website, which has been and will continue to be maintained by his friend Tom K Ranheim. 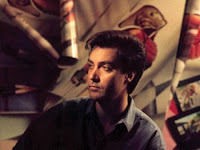 Dave Stevens, the profoundly gifted comic book creator and illustrator, passed away on March 10th at the age of 52, after a long (and privately fought) battle with leukemia. His life and work have have a profound impact on Bettie Page the person and Bettie Page the enduring icon. Falling in love with her photos and film reels, Dave honed his clean-lined style by faithfully bringing the then-"missing" Bettie to life on bristol board. Eventually, he would incorporate her likeness in his title, THE ROCKETEER, as a character named "Betty", the girlfriend of the title's hero, Cliff Secord. A retro-pulp adventure about a boy who uses a jet pack to fight for justice, began modestly as a back-up in Mike Grell's STARSLAYER in 1982. THE ROCKETEER's fame snowballed, raising the profile of both artist and "model". Dave's stunning renditions and interpretations of Bettie Page ( in ROCKETEER, scores of pin-ups and in the authorized BETTIE PAGE COMICS) created a legion of fans, priming the pump for Bettie's return to the public eye. Ironically, when THE ROCKETEER was finally translated to the big screen, "Betty" the character was deemed too hot for a Disney title, leaving Jennifer Connelly to play a re-named, toned down girlfriend to Billy Campbell's "Cliff". If Dave's only contribution to Bettie's life was through the beauty and impact of his art, that would warrant eternal gratitude on the part of Bettie and her fans. However, once Bettie resurfaced, Dave was among the first to seek her out and compensate her for using her image without her (admittedly, impossible to attain) permission. Thereafter, he not only lobbied within the creative community to urge artists to do right by Bettie, he also became one of her few close friends and confidants, driving her to doctors appointments, the grocery store and the like. Dave Stevens, the friend and the artist, will be missed by all who have been touched by him. Bettie fans, whether familiar with his work or not, should be profoundly grateful for the ways his humanity and genius have help cultivate Bettie's current popularity. Read an in-depth interview with Dave Stevens in COMIC BOOK ARTIST, in which Dave discusses his entire career and his relationship with Bettie Page. 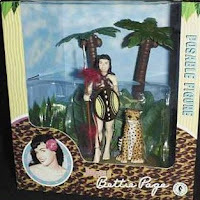 Hear snippets of an interview Dave Stevens conducted with Bettie Page. Buy Dave Stevens products from Dark Horse. 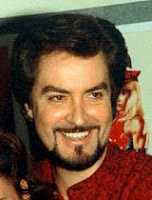 Read scores of tributes compiled by Tom Spurgeon at THE COMICS REPORTER. Heidi MacDonald of PUBLISHERS WEEKLY'S BLOG, "THE BEAT"
Learn more about Dave Stevens, courtesy of Wikipedia and his own official Dave Stevens site. The official site contains a tremendous amount of artwork and a list of nearly all his published work. Jenna promises to be gentle to animals... humans get no such guarantee! Looking more than a little like our favorite gal, Jenna's pin-up for PeTA is getting big play all over the internet, proving once again that Bettie's iconic status. As a promotion of the campaign, PeTA is giving away the pictured pleather bikini (entries due by April 5th). The PeTA site also features wallpaper of the ad and a video about the shoot. The only thing missing from PeTA's press? The name of the lady who inspired the photo's theme. C'mon, PeTA, how about a little credit where credit is due!? !